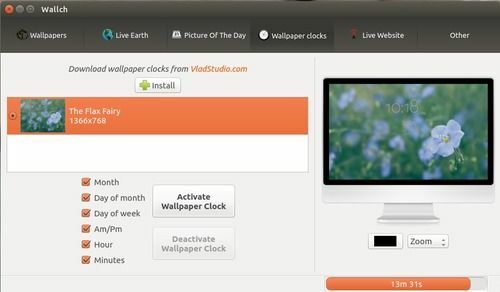 Wallch is an automatic wallpaper changer for Ubuntu Linux. 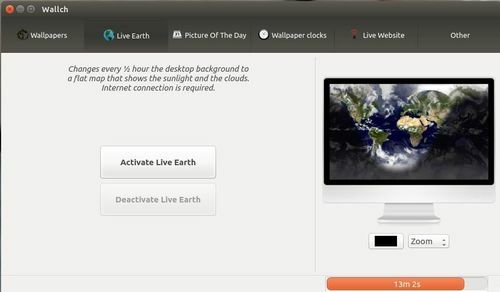 It features random image, Unity indicator, Live Earth wallpaper, wallpaper clocks, and Picture of The Day (wikipedia). 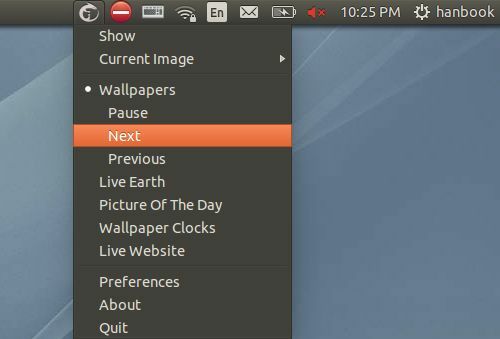 Wallch is a free and open source app that works on Gnome, Unity, LXDE, Xfce and Mate. This quick tutorial will show you how to install and get Wallch working in Ubuntu 14.04 LTS. Download and click install the wallch_4.12-1trusty_*.deb from the link below. You may check your OS type 32-bit = i386 or 64-bit =amd64 by going to System Settings -> Details. Once installed, open it from Unity Dash search results. UPDATE: Below bugs are fixed by Wallch 4.12! NOTE 1. Due to bug, Wallch does not work after you installed it. Go to menu or indicator Edit -> Preferences -> Integration. Change the theme from Autodetect to Ambiance, and choose your desktop environment will fix the issue. NOTE 2: Wallch in Ubuntu 14.04 is a little buggy. When you click on Start changing wallpapers, it crashes sometimes. Just restart the app and do it again, it will be working good once it starts changing your desktop background. Thanks! Your publication was very useful! As of 2014-06-20, Wallch is in the Ubuntu Softaware Center. good advice again! thank you! Do you happen to know if there’s any way to set Wallch as the default background manager? I set this up for my parents, and they’re very confused by the fact that the “right click + set desktop background” leads them to something completely different that doesn’t seem to work (the default wallpaper manager that came with Ubuntu). Can Wallch be made to completely replace the bulit in wallpaper manager?